2 private bedrooms (2 Queen beds),1 full bathroom, sleeps 4. BONJOUR ET BIENVENUE😊 Welcome to this freshly renovated wonderful emplacement condo in the heart of Montreal at a walking distance of "Quartier des spectacles". Bought this building in 1996 and transformed it over the years. This charming place located in 'The Plateau' district is renowned for its variety of excellent restaurants, trendy bistros, art galleries, antique shops, parks, chic boutiques, designer stores. 'The Plateau' is one of the most popular and visited areas of Montreal. Plenty of small grocery store, supermarket, subway (Sherbrooke), liquor and drug store, in the vicinity. 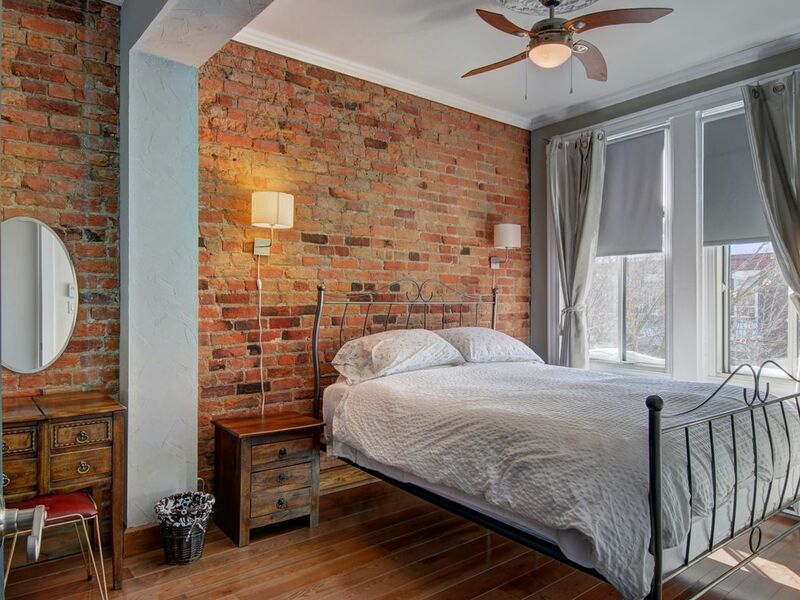 Apartment typical of the Montreal old style with is wonderful brick wall, hard floor and a skylight in the living room of a 19th century building with a touch of modern style. Very quiet for an as well located condo, spacious and very cozy. This third floor condo of a three (3) floors building with a 1000 square feet of space to appreciate this wonderful ''spot'' of Montreal, fully furnished. (Please take note that there is no elevator). CHILDREN MINIMUM AGE 10 YEARS OLD. 'Sunny cozy balcony': A sunny cozy balcony in the front with table to enjoy great coffee or relaxing glass of wine. Beds: 2 queen beds in 2 private rooms. All beds are hypoallergenic with mattress covering. Very confortable. Comme to enjoy Montreal with everything you need at a walking distance. You could also use our secure and useful subway at 5 min walking distance. The station is Sherbrooke (Only one station of Berri central station). What about Bixi (Bicycle rental stations all around to discover Montreal or even go to restsurant. Because you will have all you need to be so comfortable and unforgettable. It's clean, very well located, fully furnished and cosy:) Everything you need at a walking distance. A large modern brand new shower. Everything at a walking distance. Many attractions, most of the best in Montreal, very close:) Most of the best restaurants at a walking distance changing every year. A nice sunny cosy balcony with bistro table in the front street. Cute place & great location! We had a wonderful stay. The apartment is super cute and well equipped. Location was awesome we were able to walk to everything from here. Dany was also extremely helpful and great to work with. Conveniently located in Montréal's Plateau neighborhood, within walking distance of Old Montréal, Parc Mont-Royal, groceries and many retail establishments, as well as excellent restaurants, we could not have been more delighted with our lodging. Having been completely remodeled, our 2-bedroom flat was very comfortable, and very quiet, on a tree-lined, one-way street. And our host, Dany, was at all times gracious and attentive to any concerns we might have had. Needless to say, we had none! Without question. should we book another trip to Montréal, we will definitely stay here again. It was a pleasure to welcome and meet you. What a great couple, so nice talking with you. Had a great time in Montreal and Quebec! Dany’s apartment was lovely and in a wonderful part of town. Wasn’t able to meet Dany but he always responded right away to our emails! Try to book this place if going to Montreal! To sad we have not been able to fix our schedul to meet but I hope to see you back in Montreal soon. Good location for exploring Montreal. Close to a beautiful park and many restaurants. The apartment is clean, with updated kitchen and bath. It is nicely decorated and comfortable. Dany was professional and easy to work with. We had a car, and parking can be difficult. I found a 24 hour parking lot on the corner of Parc and Prince Arthur (about 4 blocks away). The cost was $16.00 for 24 hours with in and out privileges. I highly recommend this apartment, and I would definitely stay here again. Beautiful apartment in a fantastic location! I'm so glad we found Dany's lovely apartment in Montreal for our long holiday weekend! Quick trip from the airport, the location was perfect for us (we wanted to eat, explore, eat some more, etc.) and the apartment was really well done! Dany gave perfect instructions on how to get in (we arrived very late at night) and was available if we needed anything (we didn't though, the place had everything we needed). Thank you for stopping by for a visit Dany, glad we got to meet during our time in Montreal and we will definitely see you again! Located just 500 meter away, you can relax in the beautiful Carré Saint-Louis Park, walking distance to Place des festivals or 10 min biking the relaxing Mont-Royal mountain, a perfect place for hiking and breathtaking sightseeing. Enjoy the multicultural side of Montreal by tasting all kinds of foods from everywhere in the world. You also have the beauties of old Montreal just a short walk away. The Latin, Chinese, Italian Quartier all around. Easy access to Montreal Casino, Notre-Dame Cathedral, centaur theatre, Olympic Park, Botanical Garden, Montreal Casino, Grand-Prix Racing, white-water rafting, bike path and many other activities suitable for the entire family. In the winter months you could enjoy horse-drawn sleigh rides, cross-country and alpine skiing, dog-sleddey, snow shoeing. Golf: You have The Montreal Golf and other golf center about 20 min. by car. Ski: You could go skiing outside Montreal, about 45 min buy car.